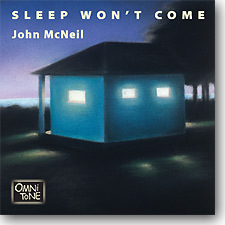 Trumpeter, composer, and part-time insomniac John McNeil's musical portrayals of lying-awake-at-4AM-staring-at-nothing scenes, ranging from piano tone-cluster mashing tunes to ECM-like grooves to Miles-ish muse, along with an Irish traditional song, and even a demented polka. Joined by pianist Jeff Jenkins, a New York 1980s new music scene ex-pat now living in Denver, and Mile High-area bassist Kent McLagan, this album is probably John's most adventurous ever and yet retains the musicality, virtuosity, and humor John is known for worldwide. Buy Sleep Won't Come now at the OmniTone store. Recorded on 4-6 May 2003 and 2-3 April 2004 at Mile High Music in Denver, Colorado.